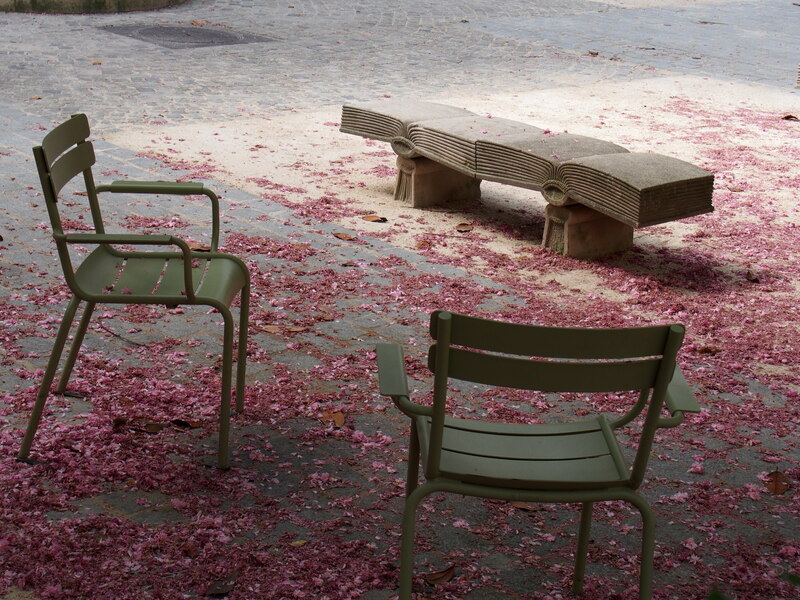 On Monday I returned from a week staying in the 5th arrondissement in Paris, a very enjoyable mix of long walks (totalling 99km, no less), art exhibitions, inspiration for my next novel, seeing friends and spending Easter weekend with my family – most of it in glorious spring weather. I’ve written many pieces about Paris and there are more in the pipeline; that’s not what today’s post is about, although I couldn’t resist a few pictures. I like the one above because the stone book bench reminds me of the logo I designed for the Literary Sofa imprint. And that brings me to the matter in hand: tomorrow is going to be a big day, when I take delivery of my personal consignment of Paris Mon Amour paperbacks, a month ahead of the official release on 22 May. I’ve gone to great lengths to make this happen – with the help of some amazing people – but still it’s hard to believe I’m going to get to hold my novel, turn the pages and see it on a shelf! To share some of the fun and excitement with you, I’m running a little competition today and tomorrow, mostly on Twitter, but also here so nobody has to miss out. If you are on Twitter, please look out for this (below) on my timeline, share with your followers and tweet me your entry over there. If not, you’re welcome to enter via the comments section on this post. Any help spreading the word is hugely appreciated – I much prefer shouting about other people’s books! 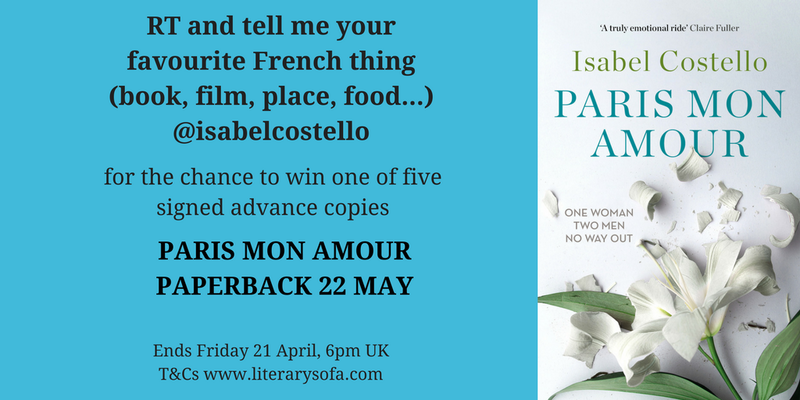 Five winners will receive a signed (and if you wish, dedicated) advance paperback edition of Paris Mon Amour: four will be picked by random number generator and one will go to the person who submitted the ‘best’ entry, in my opinion (it is my competition, after all). The deadline for entries is Friday 21 April, 6pm UK time. The winners will be announced here on Saturday 22 April and will be contacted individually for their postal address. I will also list the entries for posterity. My absolute favourite, nay treasured, ‘French’ thing is actually Japanese; it is a Navy Blue Tetsunit Cast Iron Teapot Kettle. Me & OH have only been to Paris once… a holiday celebrating his 40th and our 16th wedding anniversary but the delights of the city were juxtaposed with our recent loss of a son. Each afternoon after our meanders, we had room service which incorporated various teas in these beautiful teapots which neither of us had seen before … always hit the spot and restored us for evening jaunts. Before we left we bought one and a suitcase full of teas from nearby Fauchon on Place de Madeleine. It always has pride of place in any kitchen we have lived in since (there’s been a few!) and is a constant reminder of a both a fabuolous city with it’s restorative powers and the folklore that these teapots symbolise ‘strength & unity’… and of course, it still makes a great brew! Thanks for your entry, Poppy. It’s a very touching story, although I’m so sorry to hear that Paris also has such sad associations for you. I hope you get to go back and enjoy the city again soon! Not at all, Poppy. I don’t know if you’ve read my book but in fact, that’s exactly what I tried to do: get behind the tourist façade, lovely as that is. I love so many things French but if I had to name a particular thing, it would be the film ‘Amelie’. Its quirkiness and focus on the minutiae of life is typical of the French style, which is both charming and enlightening. I hope to return to the magnificent city of Paris one day soon to explore the many things I didn’t manage on the first holiday with my now husband, nearly fourteen years ago. Good luck with the book launch — cover looks great. Ah yes, what a sweet film that was. I loved it too, despite not generally being a big fan of quirkiness (or at least not the cute kind)! I lived in the south of France (Aix-en-Provence & Marseille) for 6 years, so I adore everything French. I would say that garlic is something I have carried through from my years there, and I even put tiny amounts in my daughters’ food when they began eating proper food, so they absolutely adore it now as adults! My hubs keeps promising to take me to Paris – although I did visit there a few times with my then French boyfriend! Gosh, lucky you (how did you bring yourself to leave?)! I know that area really well and we are hoping to retire there. I ask myself the same question many times! Very envious of your hopes of retiring there. What a lovely scene you’ve painted there – just the kind of evening my late father loved so much. Never picked up more than a few words but had no trouble bonding with strangers over a little bottle of Stella (in his case)! My favourite French novel is Le Grand Meaulnes by Alain-Fournier, perhaps because it’s the only one I’ve read entirely in French. We all have a memory of a lost place, time or person we wish we could return to, so this book strikes a deep chord in the memory. The love story is timeless, and the vivid descriptions of interiors enable the reader to experience French country life before the First World War. Stunning photos Isabel – makes me want to go there and see the locations myself. It’s quite a few years since I last visited. It was meant to be a romantic break with my husband taking advantage of the fact I was near to Paris anyway for a business trip. But a certain volcano in Iceland had other thoughts so there I was in one of the most romantic cities in the world on my home – and my husband stuck at home. I took myself off to the Rodin museum while I waited to see if he could get another flight – it’s a wonderful place. The sculpture garden on a bright sunny day is magical and mercifully free from crowds.